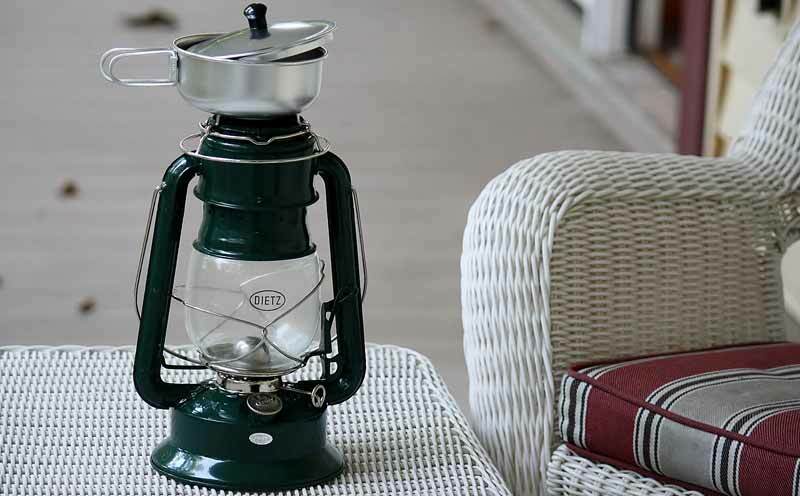 This hurricane lantern is a camping lantern that transforms into a camp stove for cooking when the top is removed. Bring light to your campsite while cooking dinner with ambient heat. An aluminum cooking rack and a small pan just right for heating water is included. The setup also contains a snap on bottom bracket with pegs to hold the cooking oil lantern steady. It's the perfect addition to your camping gear and can be used inside in case of an emergency power outage. Globe lifting lever makes lighting the wick and blowing out the flame a breeze. If you are hungry and wandering in the dark, this lantern is the one for you! Made by Dietz Lantern Company.